When I was a teenager, a friend organized a weekly Friday night get together to learn American Sign Language. It was open to any of my friends (from kid to adult) who wanted to join the class. There were about 40 of us who regularly attended. A deaf instructor who taught at the local college agreed to teach the class. This was the most fun 2 hours of every week, honestly it felt like a weekly party. We brought pizza, and snacks, we played games, put on plays, we laughed so hard. I remember one time we were playing this game where we were all split into 2 groups. I don’t remember what the game was, but I remember being carried by both groups (kind of like crowd surfing) and 1 group was pulling me one way, and the other was pulling me the other – we had way too much fun. We used sign language in all our games and throughout the whole evening, and do you want to know something? We were absorbing the language effortlessly, like a sponge. I completed the college Levels 1 & 2 through this weekly party and you could say I aced those levels. But then I moved. I wanted to continue learning ASL so I signed up for Level 3 at a local college. And that’s when the party ended. There were school desks, text books, grammar, assignments, and exams. No matter how hard I tried, my brain did not want to comply with this learning method. Now it was work, and I was not doing well at all. So I didn’t continue after Level 3. When I became a mom, I began to look into learning it again. I had heard about babies being taught to sign and that it reduced frustration because they were able to communicate even tho they couldn’t talk yet. I wanted to be able to offer that to my daughter. That and I thought it would be an easy 2nd language to learn. What I knew from my experience was that it had to be fun or forget it. Learning should be enjoyable, not complicated. I started searching online and eventually came across “Signing Time”. Signing Time is a series of videos designed to teach children to sign through songs and stories and just plain fun. It’s marketed for ages 3-8, but frankly anyone watching will learn a lot as over 1000 signs are taught in the series. I bought it all in a bundle – every video, and also the board books, flash cards, and cd’s. I’ve been very happy with my purchase. The cd’s and flashcards, I wouldn’t spend extra money on, but the video’s are well worth the investment in my opinion. There’s also Baby Signing Time which is for 3 months-3 years old. I would watch Baby Signing Time with my daughter when she was a baby. I then signed those signs to her in our everyday life. For example, before nursing, I would sign MILK. Then I might ask her MORE MILK? I continued to sign to her, and then at 9 months she began to sign back. That was an exciting moment. Her first sign was MORE. Her signing vocabulary took off from there. Here’s a 45 second video of my daughter signing as a baby. I love this post, and I love love love the video. I love your prospective. I think it’s wonderful. Thank you for sharing. I am going to share this post with others. I’m pinning this to the mommy monday blog hop pinterest board! Thanks so much for linking up with us at the #homeschoollinkup! Thanks so much Lisa. I love the video as well, but of course I’m a tad biased :P. I’m going to check out the Mommy Monday blog hop next week. 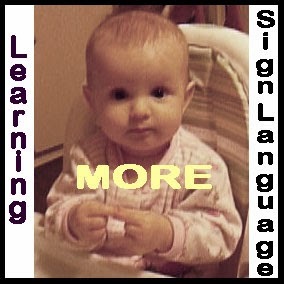 Sign language is amazing for communicating with kids!